my personal favorite for tough buns - a hair screw (though I haven't found them anywhere in a long time). 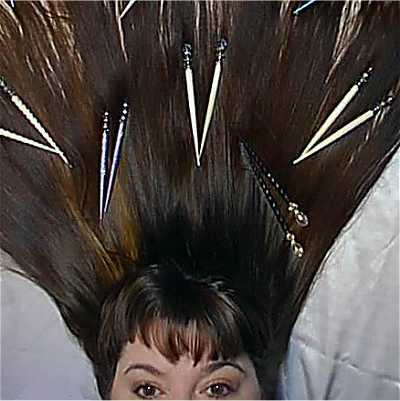 I found a wonderful hair screw at the Bronze Jewelers. They also have metal "snoods" or bun covers and barrettes. Here is a link to their site. OOh the cheat sounds fun! How long is your hair Space_Cadet? Well - when it's wet or pullled straight my hair reaches my waist - but since I've got incredibly curly hair (see the customers gallery - I'm the blonde curly hair with pictures of 3 sticks) my hair falls about 6 inches above my waist when it's just down and I let it dry naturally (which is typical). My hair makes a knot really easily though - and holds it on it's own - I typically to the knotted ponytail part but just with the top half of my hair for a great effect (and use sticks to hold/decorate it). For the knotted ponytail with my whole hair I usually do the cheat way I mentioned unless I do it on my hair when it's wet - then I'll do it the real way and usually do something like shape the curls as they dry or make lots of little braids in the tail. Pictures of what? My hair or a specific 'do? I've got one on my sig here and 3 on the customer gallery pages..unless you mean someone else? Oh actually I meant a pic of your hair in the knotted ponytail! Hi! 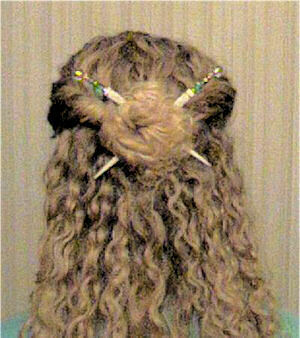 I'm looking for a picture of a prom updo, and I think I have something in mind.. I'm thinking of a hairstyle that has twisty-type things, and at the tips, kind of spikey.. Am I making sense?? If you have any pictures of something like that, please reply and tell me where I can find them! Or even if you know any websites that have pictures of updos for prom, please help me find them!! Thanks alot! How do they do those twisties? Would it look goofy on curly hair? Aren't those styles on Crowning Glory great??!! I'd love to have someone around all the time to braid my hair like that. Anyway, the twisties.... they are done by taking a small amount of hair and twisting it until the "rope" twists back on itself. In this case, they have probably twisted the rope and forced it to curl back on itself, then pinned it down, continued to twist making another twistie, pinning it, etc. I have seen this done on curly hair and it looks fine. You might want to play around with the amount of hair that is used to create the twistie to get the desired effect. The more hair included, the bulkier the looping will be. Thanks bikerbraid! I have a few *very* short locks on the crown of my head, and have been wondering how to do something fun with them until they are long enough to ponytail. P.S. I like your new photo! Thanks, Kate. The picture is actually 2 years old. When I went biking this week, my braids now criss-cross over the helmet - hopefully I can get a new pic soon. Doing the twisties on shorter hair is an excellent idea! If you need to dress it up, you could get some of those crystal bobbi pins to hold them in place, or put the tiny flowers in the center of the twists. Prom Hairsytles! Help me please! !